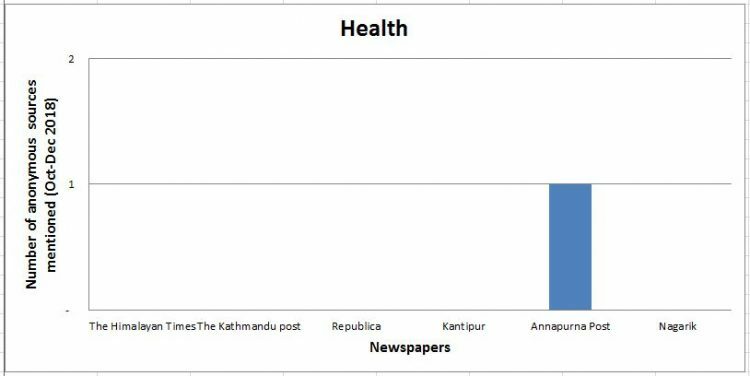 During the three months between October 1 and December 31, 2018, among the six major national dailies that we monitor, Annapurna Post daily used the most number of anonymous sources in the front page reports. It used a total of 117 anonymous sources in the front page reports during the period. 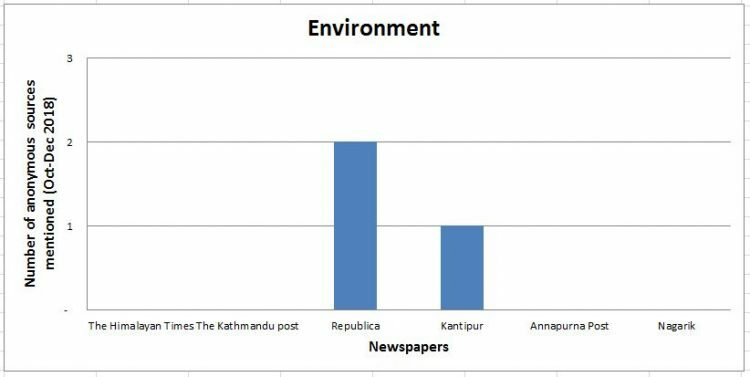 After Annapurna Post, the dailies using the most number of anonymous sources included The Kathmandu post, Nagarik, Kantipur and Republica respectively. 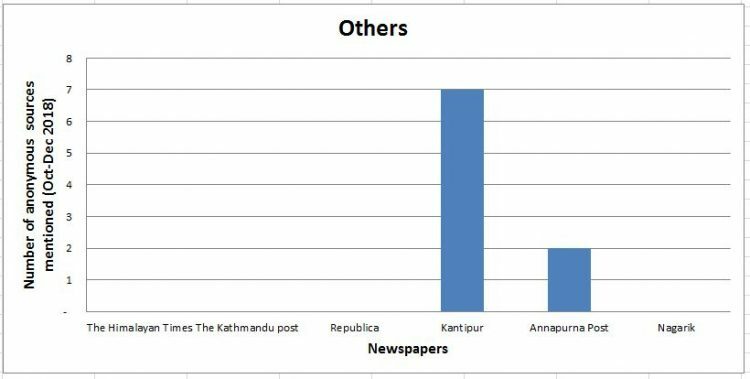 The Himalayan Times used the least number of anonymous sources during the period. In the three months, it used 68 anonymous sources in its news reports. 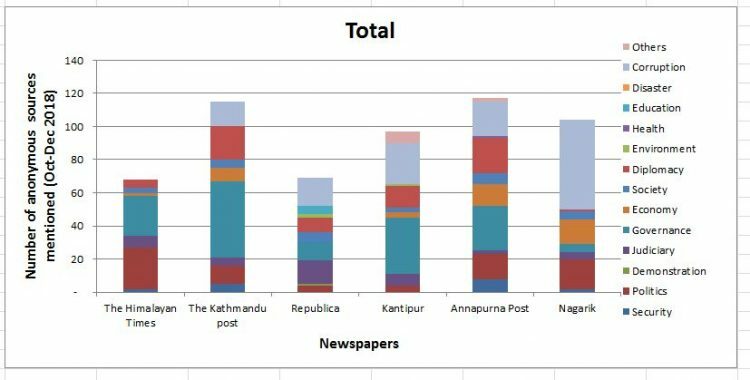 During the three months, the front page reports of the six dailies used altogether 569 anonymous sources. 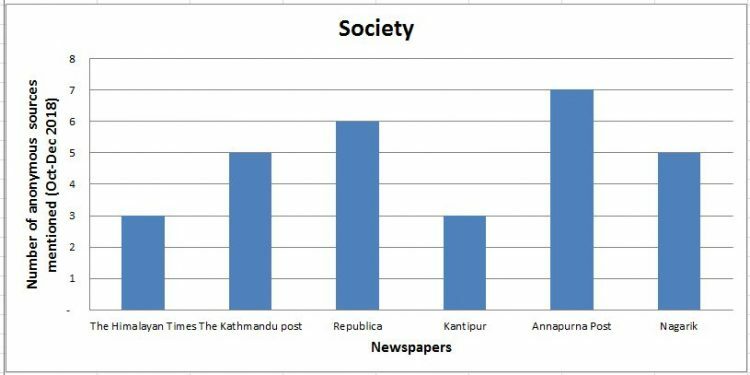 Most of the news reports on the front pages of the newspapers were on politics. 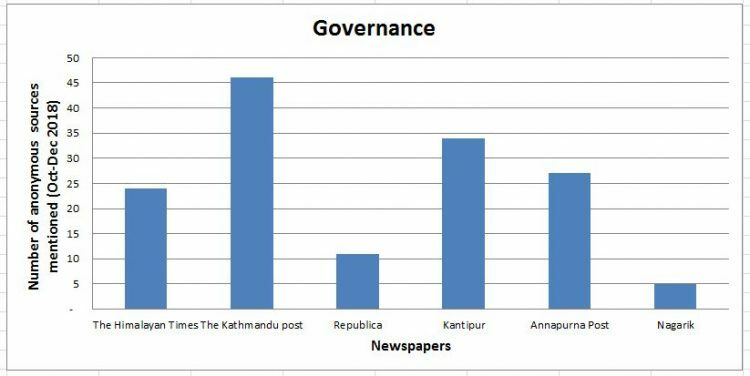 But anonymous sources were mostly used in governance-related news reports (in 147 instances) during the period. 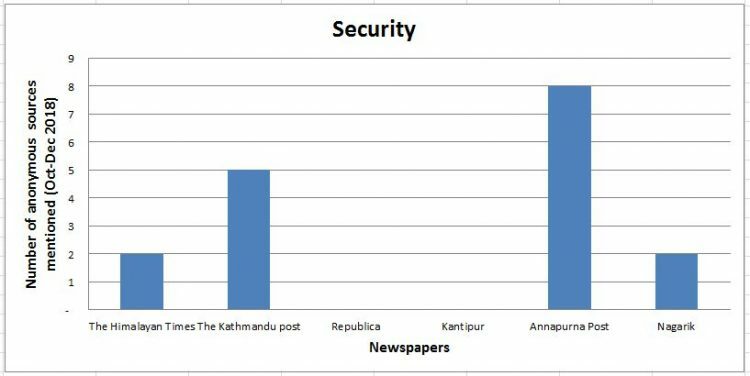 The Kathmandu Post and Kantipur were the first and second national dailies respectively using the highest numbers of anonymous sources in their news reports related to governance; The Kathmandu Post used anonymous sources in 46 instances and Kantipur in 34 instances in such reports. 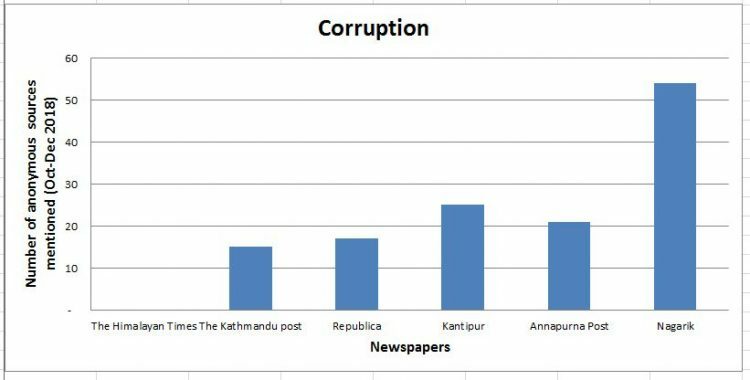 Corruption is the second topic in the Nepali newspapers where anonymous sources are used in highest numbers. 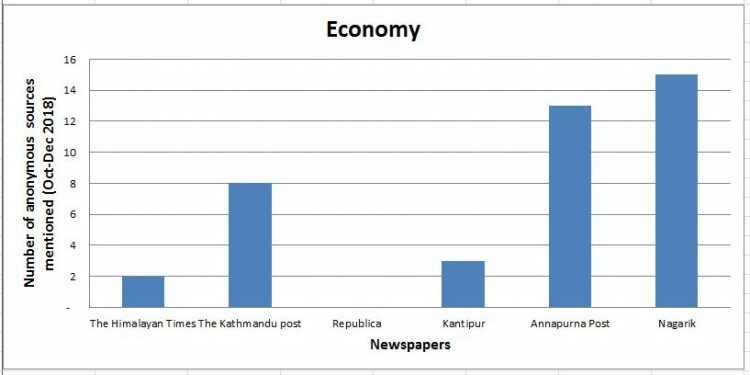 During this period, anonymous sources were used in 132 instances in corruption-related news reports in the six newspapers. 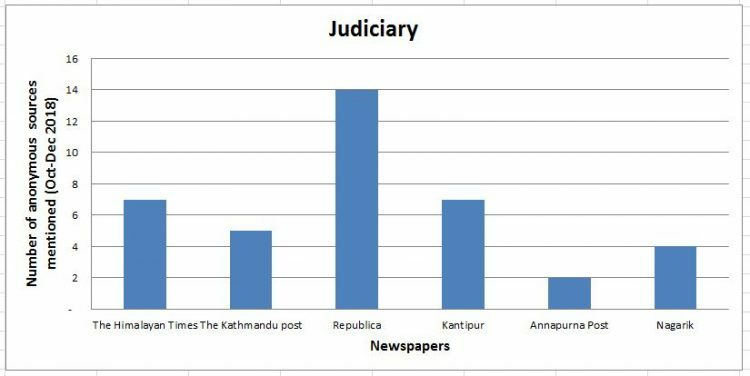 Nagarik used the highest numbers of anonymous sources in corruption-related news reports. Interestingly, there were no anonymous sources in disaster-related reports. “All the ministers in the government are doing commendable jobs. This government is clean. It is working to achieve the goal of prosperity,” an [NCP] standing committee member quoted Oli as saying. “This government has not committed corruption. No minister has committed crime. 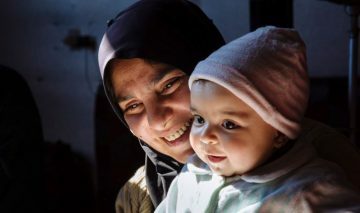 The government will work more effectively,” he added. In this news report, the use of anonymous source looks unjustified because revealing the identity of the source would not cause him/her any harm. Click here to download the spreadsheet of anonymous sources statistics prepared by South Asia Check.